Home / Editor's Choice, Featured Articles, Gossip and Drama, News, Videos / These Ngong Matatus are a death trap, Check out this accident that happened along Southern by-pass, SHOCKING VIDEO. These Ngong Matatus are a death trap, Check out this accident that happened along Southern by-pass, SHOCKING VIDEO. Wednesday, September 12, 2018-A shocking accident scene involving a matatu that was heading to Ngong was recorded by an eye-witness and shared on social media. The speeding matatu lost control and veered off the road and then turned upside down. 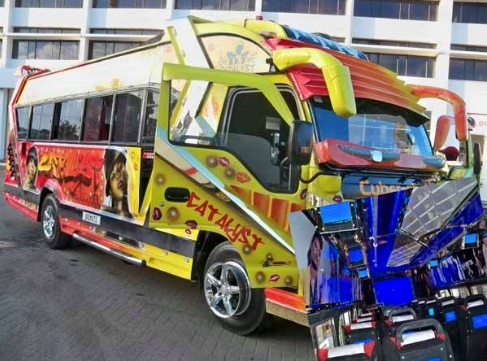 Ngong matatus are infamous for recklessness on the road. The drivers don’t follow traffic rules and they get away with it because most of those matatus are owned by prominent Kenyans. Check out this video from the accident scene.